To view or download a detailed price list of all our paddles click here. Our new high performance carbon fiber wing blade designed for racers and advanced kayak paddlers. An economy priced nylon/carbon wing blade designed with racers in mind. The Kicker is an ideal paddle for families, clubs and kayak touring initiates. One paddle fits almost everyone! Great for racing in Dragon boats. Great for racing Senior C-1, C-2, C-4 or War Canoes. Ideal for beginners and children. Great for racing in Bantam and War canoes. Convert your kayak paddle into a canoe paddle with this convenient T-Kit. Curious about a different feather angle? Like a longer paddle for your new sit-on-top kayak? 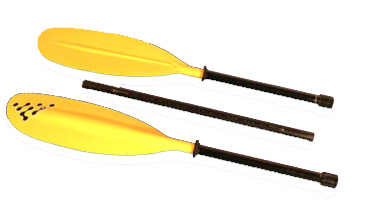 Simple to adjust in length and feather, SRS paddles using our patented E-Z Set 2, 3 and 5-piece shafts can adjust up to a length of 50 cm.